Quality, captive-bred pythons? It's elementary! Thank you for visiting Periodic Table Pythons! It doesn't take a rocket scientist to know we are committed to producing healthy, beautiful ball pythons for the breeder, collector, and pet-owner alike. Our snakes are members of the family, first and foremost--our focus is on the well-being of the animals and not producing clutches or selling offspring. All pythons have their own names (typically named after an element in the Periodic Table) and are given the best care and attention possible. 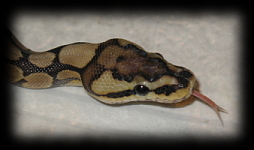 We breed ball pythons because we love snakes; the little extra money on the side is merely icing on the cake. In addition to quality pythons, we strive to provide superb customer service and satisfaction. We want you to be happy not only with your snake but also with the entire transaction. Please let us know if there is any way we can improve your visit or purchase. Thanks to everyone who came out to the show a week ago! We had a blast, and I hope you all did too! I've updated a lot of the snakes on the Collection page, and I finally have the Incubator pages fully updated! The For Sale page has minimal information on it, but at least it isn't full of snakes I've already sold anymore!